Though Diablo 3 isn’t the most graphic-intensive game of the current generation, some people may have performance difficulties/issues in-game. While the best solution would obviously be an upgrade in hardware, there are plenty of other things that can be tried, out of which the most essential is meddling with the D3Prefs.txt file. The value is ‘42’, and should be NOT be altered. Doing so may make the game unplayable. There are 4 values from 0-3. This command indicates which video should be played in the Acts. Since Blizzard’s done a fantastic job with their video cutscenes, I suggest leaving it alone – unless of course this is the 10th time playing the game, in which case you can delete these so the videos don’t play. Have the value set to 1 to play the game in a windowed mode. This is the game resolution value when the game is run in windowed mode. This is the game resolution value when the game is running in full-screen mode (default mode). This is the value of the Refresh Rate of your screen while running the game. If your screen supports higher RR, change the value to it. This is the color bit-rate of the game. Unless you enjoy old-school VGA 16-bit colors, I suggest you leave it like it is. The gamma value used in-game. Value ranges from 1-3, with 1 being the lowest detailed and 3 the highest. Set it to the desired value. This is the physics details in the game, ranging from 1-3. Set to desired value for game performance. This changes the quality and density of clutters in the game; ranges from 1-3. Binary value of 0/1, where 1 is for enable. Vsync will limit your FPS equal to that of the screen Refresh Rate. Disabling may increase FPS, but can cause screen-tearing. Assign value 1 for enabling AA, while 0 will turn it off. Turning AA off can give massive performance boosts, but may produce jagged texture and polygon edges. Set to 1 to reduce the quality of effects in the game. This will boost performance but reduce visual quality. Enable/disable limit of the foreground FPS. Enabling this will activate the following command. Set the foreground fps limit to a certain value. 150 is the default value, and I see no reason to change it. Enable/disable limit of the background FPS. Enabling this will activate the following command. Set the background fps limit to a certain value. 41 is the default value, and I see no reason to change it, as changing it will not increase FPS of the game (it may actually decrease them). Set 1 to disable trilinear filtering, or 0 to leave it enabled. Setting to 1 may improve performance, but lower visual quality. Determines the quality of reflections. Set 1 for high quality and 0 for low. Enable/Disable color correction. I suggest leaving this to 1. Adjust the different volumes of the game. Swap left/right channels of headphones/speakers. Enable/Disable subtitles for in-game quest-related conversations. Enable/Disable subtitles during cinematic cutscenes. The in-game dialogues also appear in the chat on the bottom left corner when value is set to 1. Mute the various audio parameters in the game. The values are identities of your hardware devices; do not alter this. We are unsure of the function and effect of the above listed variables. If you know their function, performance changing effect, and/or sensitivity please share with us by commenting. You can read the detailed instructions on how to tweak Diablo 3 to run on unsupported graphics card here. 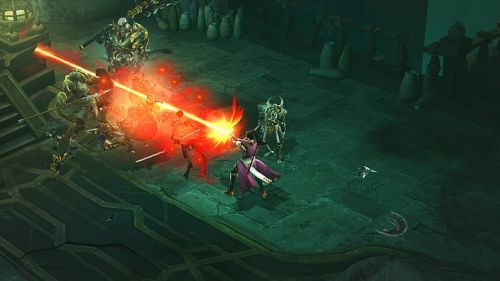 Read this Diablo 3 guide for detailed instructions on troubleshooting different errors, graphics and performance issues. Additionally, if we have missed any variable that you are aware of, please share with it with us by commenting below! Did Blizzard Blow Diablo 3’s Launch?